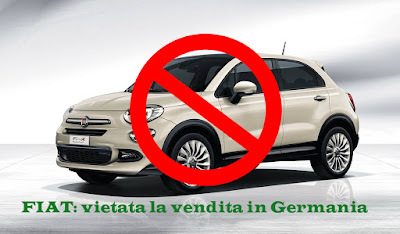 Bad news for investors, customers and FIAT workers arriving from Germany, a new scandal FIAT Chrysler Automobiles Dieselgate for emissions of 500 X 2.0 Multijet diesel, the German Minister of Transport would have called for the cancellation of approval of this machine from the streets of Germany. This immediately led to a collapse of Fiat shares only 5 points yesterday, for the journalistic indiscretions that came out about this problem that would Italian cars in Germany. What is known so far is that the problem starts from January, when the German body responsible for the control of polluting emissions has found irregularities rehearsing with the new FIAT 500 X 2.0 Multijet . The machine, after a while the engine was warm radiated emissions of Nitrogen Oxides (MOx) 20 times higher than the maximum limit. The test was made in February 2016 with a Fiat 500X (Euro 6, 2015 EZ 4400 km mileage). Here clear signs were found to be 22 times exceeded the limits of NOx emissions and have found the presence of "prohibited off." Three months later, comes the presentation of the audit report, the Federal Department of Transport (BMVI) has initiated the procedure for the withdrawal. The May 20, 2016, they sent to Italy to the report of the European Commission entitled 'improper shutdown of the Fiat 500X' is the Ministry of Transport has established a violation of the approval legislation. Under Article 30 of EU Directive 2007/46 / EC, Germany can only initiate such a process, whether non-compliance with the Directive previously stated unequivocally. "We ask the head of Fiat Germany immediate STOP to the sale and delivery for the Fiat 500 2.0 MultiJet and all other diesel cars with manipulation implants prohibited," said Jürgen Resch, CEO of DUH. What happens now to Fiat cars that pollute, what will happen to FIAT FCA? Fiat already February said that repeated tests at its facilities and pollutant emissions, have undercut the parameters for European approvals. But here we are faced with a debate between Fiat and German Transport Ministry, as some newspapers suggest, you decide what is good or not for German roads, is the German Transport Ministry, not Fiat or Italian politicians, who are already positioning itself in this diplomatic row that will see opposing Italy and Germany. If the German Transport Ministry has withdrawn the approval to the Fiat 500, it means that they can no longer move for German roads. If the Fiat initially just stop sales, reservations and distribution, the real problem will start when also already homologated cars and they already have been sold will be outlawed. At that point, the clients must be compensated by Fiat cars because they have bought the car good, however good it is. The limits for pollutant emissions are a European Union parameter, so if you have been overcome in Germany from 500 X Multijet, still pass in the other 27 member states, and then the store should be held throughout Europe. 500 X is one of the most sold by Fiat cars that could have a huge backlash from this affair, just in a particularly positive moment for Fiat (remember the agreement with Google). In addition to stop sales, in addition to replacing the engine (or the cabinet) to the new car, Fiat will have to do the same thing as Volkswagen, that is, set aside billions of euro for the fine that inevitably will come to have established a real scam (Volkswagen has set aside in 2015 something like 10 billion euro to pay the fines).